NEW on Draw Central, FORUMS!! Naruto is one of Japan’s most successful anime, and we here in the U.S. aren’t immune to it’s popularity. There have been many reader requests for me to do this tutorial– so today I will answer the call and teach you how to draw Naruto. As always, the first step is the most basic. 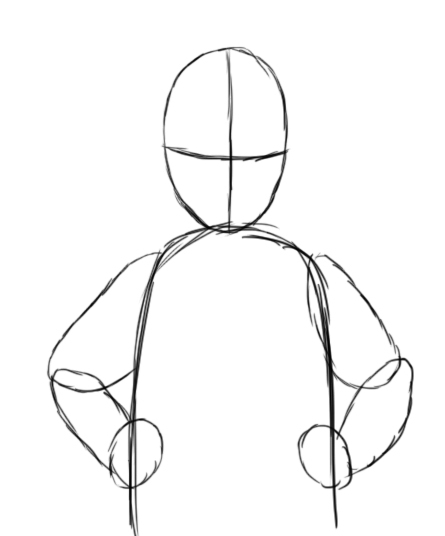 We need to start by drawing a head and midsection for Naruto. To do this, draw a long upside-down “U” shape, with an egg-shaped oval on top, that is divided into 4 sections. 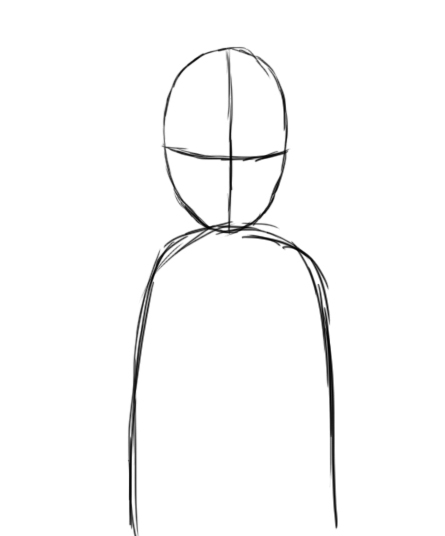 This oval will be Naruto’s head, and since we are only drawing Naruto from the waist up, make his midsection about 2 head lengths tall. 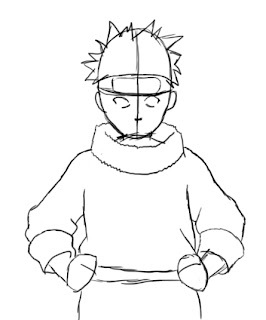 For this drawing, Naruto is standing with his hands on his hips. 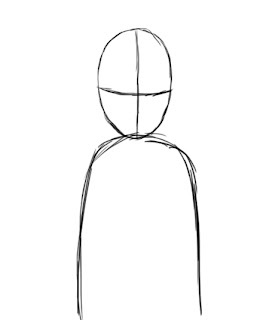 To draw this, map out his arms in simple ovals. Make two ovals of equal length, one that points away from his body, and another that points back in and connects with his hips. 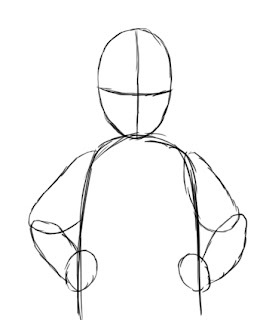 Then, draw a small circle at the end of each arm that will eventually become Naruto’s hands. At this point, we need to map out some of the details of Naruto’s face. If you divided his head into 4 sections as stated in step 1, then this is a fairly easy process. 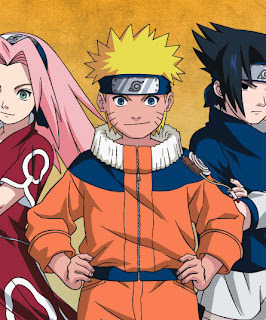 The horizontal line that goes across the middle of Naruto’s head is going to be the bottom of his headband. Right below his headband (almost touching), make the outlines for his eyes by drawing a couple simple almond-like shapes on either side of the vertical line. 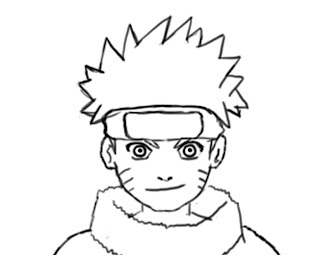 Directly on the vertical line of Naruto’s head, draw a small horizontal line about halfway between his eyes and the bottom of his head. 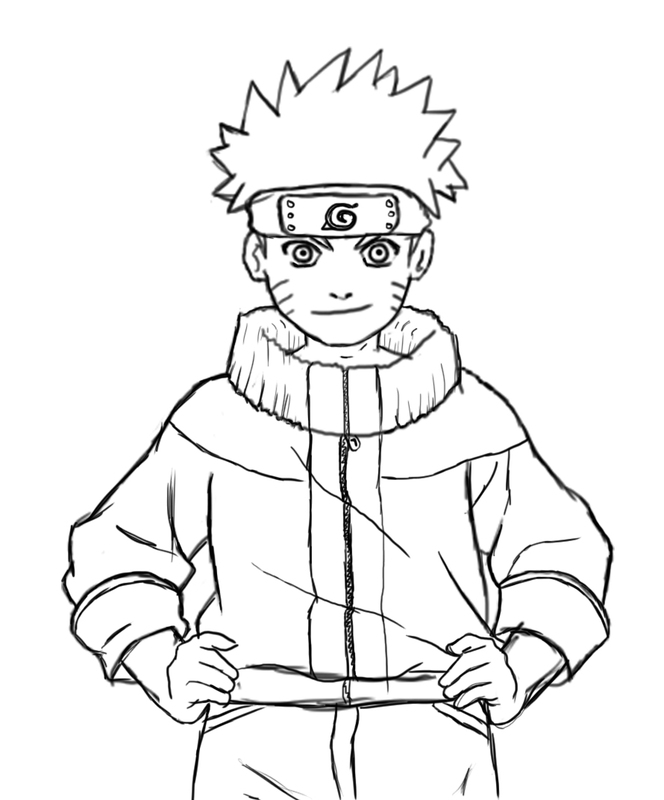 You can also draw some spikes around the top of Naruto’s head that will become his hair. In this step, we will also draw a doughnut-shape around his neck that will serve as Naruto’s over-sized collar. 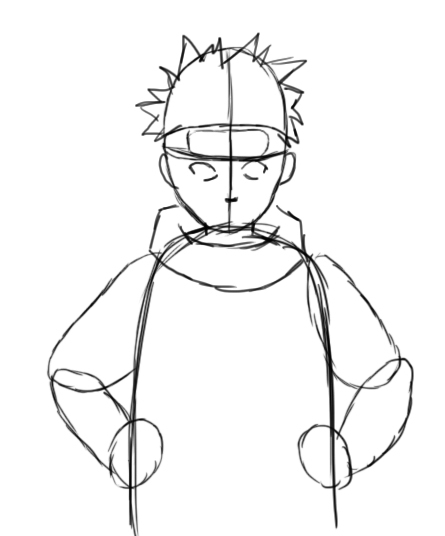 After you have Naruto’s basic body drawn, the next step is to add a little form to him. 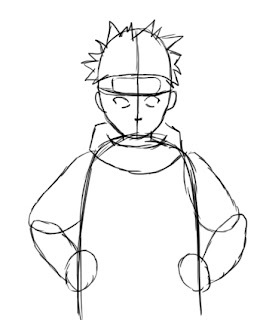 Erase your overlapping lines, and join all of your shapes together to form Naruto’s complete body. Draw shirt cuffs at the end of each arm, and a couple bumpy wrinkles on each elbow to make it look like Naruto is wearing a shirt. Almost done! At this point, we are going to start to add details to Naruto’s face. Looking closely at the picture on the left, expand on the outlines of his eyes you drew previously. Follow the contours of Naruto’s eyes, which curve slightly downward, pointing to his nose. Also, note that his upper and lower eyelids do not completely connect together. A couple large circles to form the iris and pupil of each eye, and you’re done. In this step, we also need to draw the three lines on each of Naruto’s cheeks, and a large rectangular metal plate on his headband. As with most of my tutorials, the last step is just to fill in the fine details of your drawing. 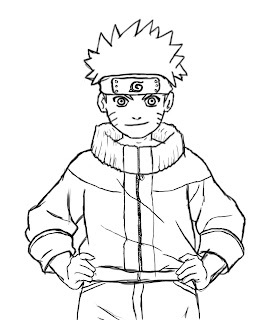 Draw a thin zipper that cuts down the middle of Naruto’s shirt, and add a few vertical lines in his large collar to give it a textured appearance. 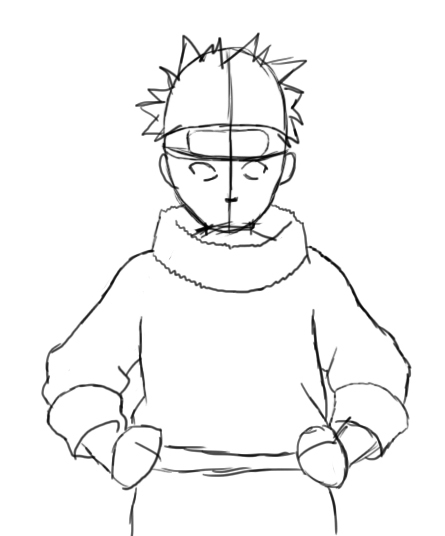 Give Naruto a belt that cuts across his waist, and a couple lines for pockets near each of his hands. Draw in Naruto’s trademark spiral design, and a few wrinkles in his clothes, and you’re done! Thanks everyone, and don’t forget to comment and share on Facebook!